Cool pasta salad is one of my very very favorite things to make on a hot summer evening. You get all of the satisfaction of an honest to goodness supper, all in a delicious, refreshing plateful. And when you add in some tender seafood and a ginger dressing with just the right amount of bite to it, all the cares of your hazy hot and humid day will vanish away. Promise. I like to start this one by making the quick and spicy dressing first, so it is all ready for the salad when you are ready to mix it up. The dressing is a simple stir-up of mayo, plain yogurt (I like the Greek kind. I feel like I was the last person on the planet to find out how just plain fabulous Greek yogurt is, but hey, better late than never). Add in some soy sauce, some sugar, and a generous amount of ginger. Give it a taste, and if it doesn’t make you open your eyes a little wide at the zing, shake in some Tabasco. The salad itself has some well-behaved ingredients, so we need the dressing to be a little naughty. On to our salad. One of the great things about this one is that you can be as experimental as you want to be with the seafood. As a matter of fact, if you want to ditch the seafood altogether and use shredded cooked chicken, that’s perfectly fine! 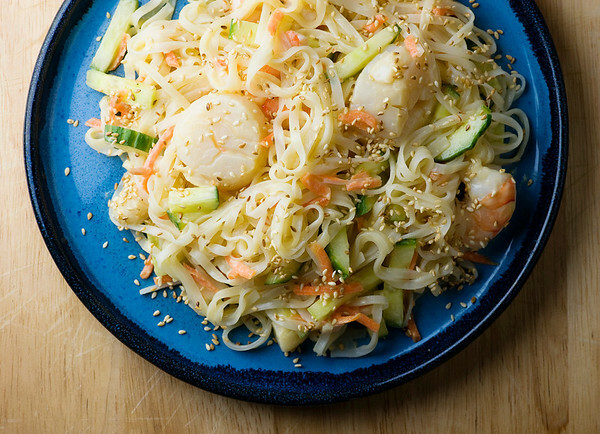 On this particular evening I used a mixture of large scallops and shrimp, which I cooked just until they were done and tender, but I’ve been known to make it with just shrimp, or to throw in some crab. One day I will do it with lobster and my world will rock. Anyway, once you have your cooked seafood (or chicken) done and cooled down, cook up some linguine and cool that down under cold running water. And now comes the fun part. You’re going to have to trust me on this next bit, but I promise it’s the only way to go. Put your cooled down pasta in a big bowl with the seafood, some shredded carrots and some chopped cucumber. If you can lay your hands on some jicama it gives the salad a lovely crunch…if not, no worries. Now pour the dressing in the bowl and mix it up good and well with your hands. Yep, use your hands…it’s the very best way to make sure all those slippery ingredients are good and covered with dressing, and that they are all combined together. You don’t want the pasta on one side and the veggies and seafood on the other like boys and girls at an eighth grade mixer. We’re looking for togetherness! Now divide the salad among plates (since my hands are in there already I just grab handfuls of it and go plate by plate. This only works if you have taken out the plates already, or if you are good at shouting to your Southern husband who is conveniently in the garage or the farthest stretches of the back yard.) Wash your hands and then sprinkle each plate with some toasted sesame seeds and/or salted chopped peanuts. And, voila! Spicy, salty, creamy, cool, wonderful pasta salad. Let’s eat! Combine all dressing ingredients except Tabasco in small bowl and mix well. Taste and add Tabasco if needed to make it good and spicy! Divide salad among plates, garnish with sesame seeds and peanuts and serve. I always like to be naughty with my pasta sauces…especially if that naughtiness involves ginger and tabasco! Love this! Me too…I think there might be a dip version of this one in my future! Every time I cook angel hair pasta, I cook the whole thing so I have leftovers for just such a meal as this. Do this a lot, but that dressing! That is something I hadn’t thought of, and I do love ginger. It’s going down on my dressings to try list, although I think it may be on a carrot salad. It would go great on something sweet and crunchy like carrots, and that’s next up for a veggie salad around here. Thanks! Yes, the dressing is definitely the thing that sends this one over the top. Carrots sound perfecto. this will definitely be on my list again this summer. kimt! You made my whole day with this comment…thank you! !